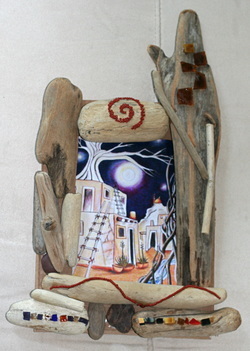 Driftwood Frame - Wareh Art Inspired by Nature . STEP ONE: Using a Box Cutter and an old cardboard box, cut out two 8” x 11” squares. STEP TWO:In the Center of ONE OF the squares, cut out a 5” by 7” inner square. STEP THREE: Start gluing Driftwood onto the cardboard frame, being sure to cover inner cardboard square (Let driftwood hang off edge a little). STEP FOUR: Add odd ends such as beads, glass, and shells onto the Driftwood. STEP FIVE: While glue is drying, Mount a 5” x 7” picture onto the middle of the 8” x 10” uncut square. STEP SIX: Once glue is dry completely, attach frame to photo mounted frame and glue together. To hang frame, puch small holes through square backing and attach a small unnoticeable string.